This is the first of the introductions to the regulars for this summer. I have found two garden orb weavers this year, both Eriophora pustulosa (family Araneidae). These are distinguished by three little bumps on the end of their abdomens. Erik-Rose is on the rose bushes. She is brownish. Erio-birch is on the white-barked birch tree. She is much paler. They vary colour greatly depending on where they rest during the day. Despite intense searching, I haven't managed to find the resting place for either. Yet! They are both still very small, less than a centimetre in body length. My hope is that both will make it to adulthood. Well, they've got this far. I shall keep you updated with their progress. But first, their photos. Click on the images to enlarge them. 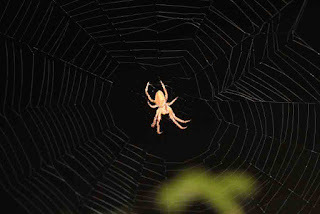 Erik-Rose is hanging in the typical pose in the web. They always hang face down. She wasn't impressed with my light and flash and presence. 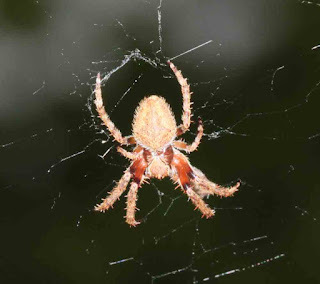 She pulled in her web and wound it up and headed back into the rose bush. She then sat and ate the ball of silk. She couldn't afford to waste all that protein! I have seen this before. I shall have to be more subtle. 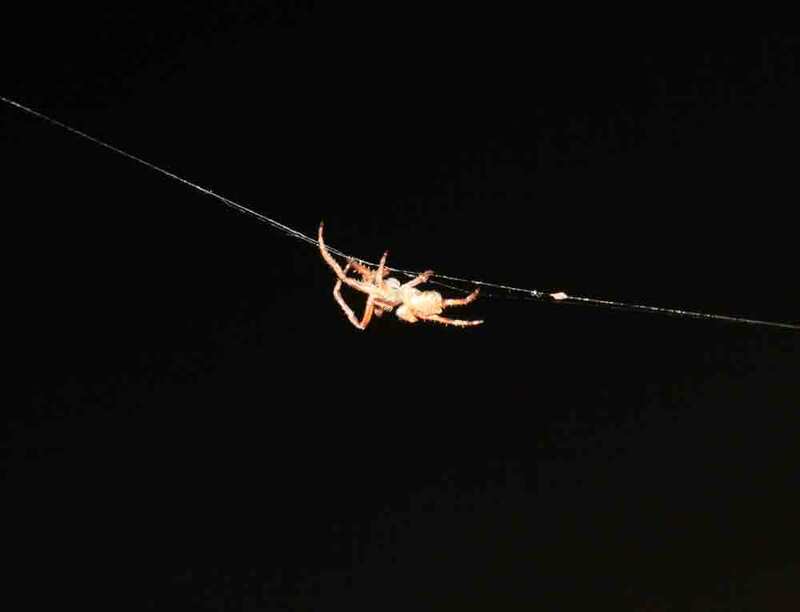 This is a moment after she pulled in the web - it happened very fast. She's heading off. This is Erio-birch looking very like every Eriophora. She's actually much paler than Erio-rose, but it doesn't show here. She's also much less concerned about my presence. Tonight, Erio-birch had moth stew for dinner. The other regulars include two black house spiders, one American common house spider and one little hump-backed spider. More about them next time! 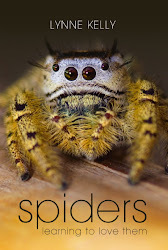 Thanks for this, it is nice to read your words on spiders again. I look forward to reading about the others. Thank you, ZBra. So nice to hear from you! It is so good to be back outside at night talking to my spiders. None of them talk back, but that won't stop me! Thank you, Velvet. An update will be here very soon. Thank you for the comment. I am jealous. Would love to have those babies and have seen them. Please let me know what happens. If you have a photo, I would love to add it to the blog. Just email it to me at: lynne @ lynnekelly.com.au (without the spaces). 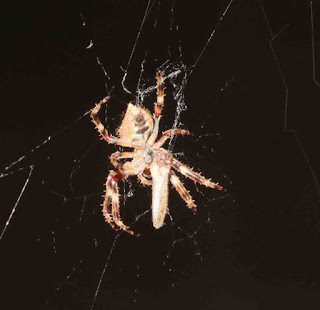 I must update - only one of my orb weavers is still going strong.